The Remarkable Hall of Fame concert will be at Bridlington Spa on Saturday 2 February. This February, Remarkable Rock’s Hall of Fame will hit The Spa Theatre. 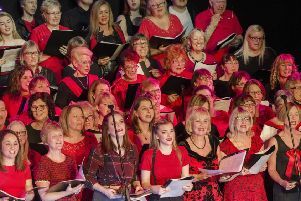 Featuring nearly 200 singers, a live band of professional musicians, stunning soloists and the fantastic Remarkable Rock Dancers, ‘Hall of Fame’ will bring together Remarkable Arts’ Rock Choirs from across East Yorkshire, as well as some of the best soloists from the region. Remarkable Arts has been specialising in large scale music events in East Yorkshire for the last six years – and this is the first time their Rock Choirs from Beverley and Bridlington will be performing in the fantastic setting of the Spa. On Saturday 2 February the ‘Hall Of Fame’ show will take you through some of the classic songs of rock with epic, six-part harmony arrangements of music by Queen, The Beatles, AC/DC, Guns N Roses, Oasis, Bon Jovi, REM, Chuck Berry, Fleetwood Mac, Meatloaf, Journey – and more. Event organiser Mark Howley said “We are all really excited for what will be one of our biggest events ever! “We’ve put together such a feel good show – I recommend rock fans come and let down your hair, pull out your air guitar and join us for one night of high energy, non-stop entertainment.